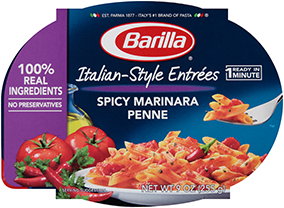 For the best quality, taste and texture, we recommend using all Barilla pasta products by the “best if used by” date stamped on the individual product package. Barilla cannot guarantee the quality of its products after that date. Unopened and opened boxes of dry pasta should be stored somewhere cool and moisture-free, such as a cupboard or a pantry. You should never store boxes of dried pasta in the refrigerator or freezer because the pasta will absorb moisture. Cooked pasta should be stored in an airtight container in the refrigerator and eaten within two days. Pasta that has been cooked but has not been mixed with sauce should be tossed with extra-virgin olive oil prior to being stored to avoid clumping. Although not ideal, cooked plain pasta and cooked pasta mixed with sauce may be stored in the freezer in Ziploc bags or freezer-safe container. Pasta with sauce should be reheated in the microwave and plain pasta tossed with extra-virgin olive oil should be reheated in a skillet with a little bit of water. You can find detailed information on how to reheat different types of pasta in our article on The Best Ways to Reheat Pasta. You can store unopened or opened bags of Barilla Collezione filled tortellini for up to two weeks in a cool, dry location, such as a cupboard or pantry. Just make sure to securely close bags that have been opened before storing. Before you bake the lasagna, defrost it in the refrigerator for 24 hours and add extra sauce, as needed. Once it has defrosted, bake it at 375 degrees for approximately 1 hour and 10 minutes. If your recipe calls for egg, the required baking time increases to approximately 1 ½ to 2 hours. Ultimately, you want to bake the lasagna until its internal temperature reaches at least 160 degrees. Hearing or seeing the edges sizzling is usually a good indication that it is nearing or at the desired internal temperature. Unopened jars of pasta sauce should be stored at room temperature in a cupboard or pantry. If you prefer, you may also store them in the refrigerator. Jars of pasta sauce that have been opened can be stored for 3-5 days in the refrigerator. If you don’t use the sauce during that time frame but want to save it for future use, you can transfer it to a freezer-safe container and store it in the freezer for up to 3 months. Questions related to the business and the company, ethics and commitment. Learn tips and tricks for cooking pasta. Learn about the best ways to reheat different kinds of pasta. Find out more about the nutritional benefits of our pasta. Make sense of the most common pasta myths. Learn the best way to prepare your favorite baked pasta dish. Discover more about our fully cooked Ready Pasta product. Discover more about our quick cooking Pronto® product. Interested in Barilla products for restaurants, cafeterias, commissaries, or other foodservice operations? Please call us at (866) 349-4386, or click here to contact us via email.